We drove from Houston, TX to Elizabeth's folks home near Cleveland, Ohio. We departed Houston about 10AM (CST) on Sunday December 21 and arrived early the next morning about 9AM EST. With the one-hour time zone change, the total transit time was 22 hours. After a day of goofing off at my (Tom's) in-laws, we drove to Sandusky, Ohio, where we checked into an indoor water park called the Great Bear Lodge . Tom and the kids had a good time riding inner tubes down the water chutes, sliding down water slides, and leaping across the big floating lilly pads in one of the pools. 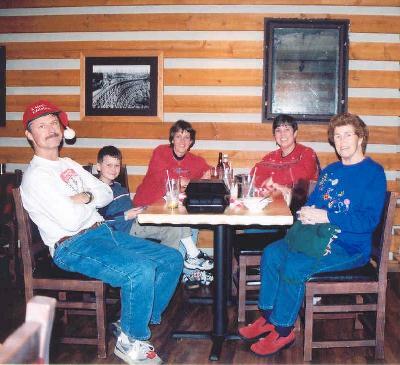 We ate dinner at a restaurant in the lodge, which featured family style servings. We then spent the night in comfort on the fourth (top) floor of the lodge. Snow was falling most of the duration we were at the lodge. In the morning, Tom and the kids went swimming again until 10:30AM, when it was time for Tom to pack up the van and checkout of the room. The kids kept right on swimming and riding the tubes down the water chutes until about noon, when we left and headed back to the in-laws home. Snow continued falling throughout most of Christmas Eve and Christmas Day as well. The kids had a good time playing in the snow and throwing snowballs at each other. On Christmas morning the kids were up early and tore into gifts stuffed in their stockings hung over the fireplace mantle. They had to wait until the rest of us woke up before they were permitted to open any presents under the Christmas tree. Sometime later around lunchtime, we all gathered to unwrap presents in the living room. The crowd included Elizabeth's folks (Marjean and Tap), her younger brother Todd, her older brother and his wife (Carol) and their foreign exchange student from Brazil, as well as our nephew (Jordan) from Montana. A good time was had by all, as we grazed on shrimp and dip, cheese and crackers, and other snacks before finally setting down to a wonderful Christmas dinner. Tom had to run a few extra miles the next morning to burn off some of the extra calories. Actually, Tom had lots of free time on several days to hit the track and run laps. Tom also helped Tap to install a wireless network on their computers. Tap was clueless, and Tom had to call technical support at Linksys on more than one occasion to get both PC's networking features to function correctly. 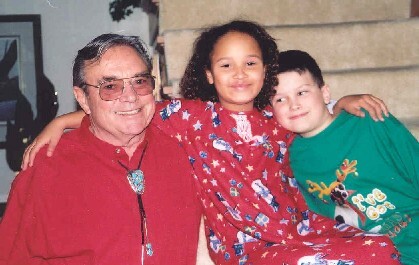 Whenever Tom got tired of running or working on computers, he would play board games with the kids, run around in the snow with our dog, Molly, or set down to read an interesting book about all the people who died in the Grand Canyon. Elizabeth spent many hours on many days shopping with her mom. I don't know how they can do that. . . I'd be bored silly. Later during the week, we drove to western Pennsylvania to visit with friends, Paula Begeot, Bill and Judy Matter, and their kids. We drove back to Ohio later that same day (night), and spent several more days at the in-laws. On New Years Eve we watched a video movie about the Grand Canyon, Bryce and Zion National Parks, and Lake Powell. Midnight came and went as year 2004 rolled in and we were still watching the movie. However, we did pause briefly to welcome in the New Year with a toast of Irish cream. On the following day (Friday, Jan.2) , we packed up our van and headed back to Texas. We took our leasure time getting home, and stopped for a long lunch in Madisonville, TX before finally arriving home to Pearland. Upon arrival, we noticed that our home was quite warm and stuffy. The outside air temperature was about 75F, and we had left our A/C on heat rather than cool, before we departed back on December 21. Logo of the Great Bear Lodge in Sandusky, Ohio where we spent December 23-24, 2003. 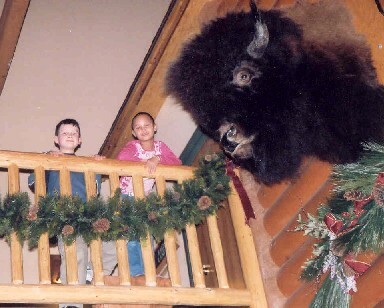 Katie Beth and Jeremy pose at the landing on the third floor of the Great Bear Lodge in Sandusky, Ohio. Dinner at Great Bear Lodge in Sandusky, Ohio. Katie Beth took this photo. Elizabeth's friend Gail came to visit with us thst evening. 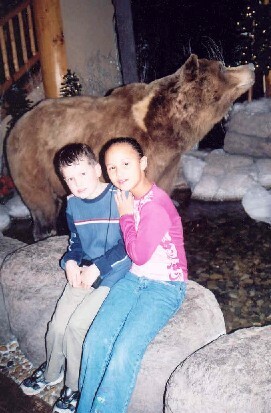 Jeremy and Katie Beth pose in front of a bear inside the lobby at the Great Bear Lodge. 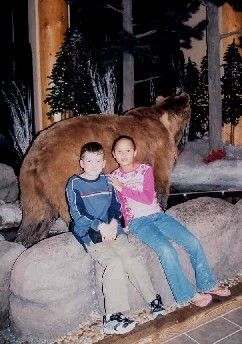 Jeremy and Katie Beth pose in front of a big bear @ss inside the lobby at the Great Bear Lodge. 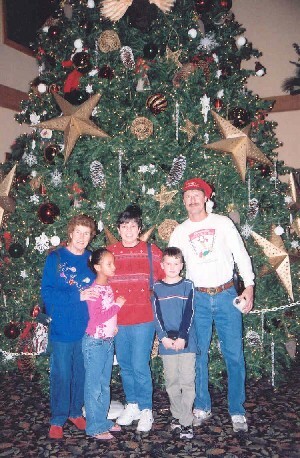 Family photo in front of the tree in the lobby at Great Bear Lodge. From left to right are Marjean (Elizabeth's mom), Katie Beth, Elizabeth, Jeremy, and Tom. Note that Katie Beth (age 7) is about the same height as Jeremy (age 8-1/2). 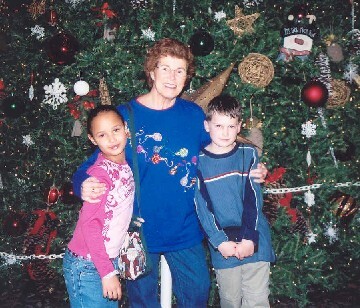 Katie Beth and Jeremy pose with their grandmother, Marjean. 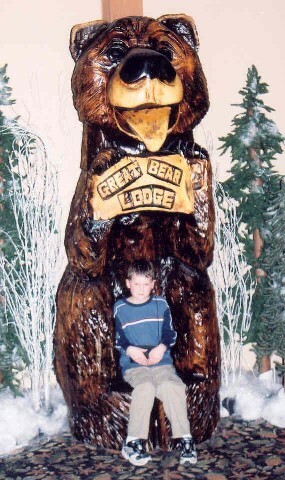 Jeremy poses on the lap of a big wooden bear at Great Bear Lodge. 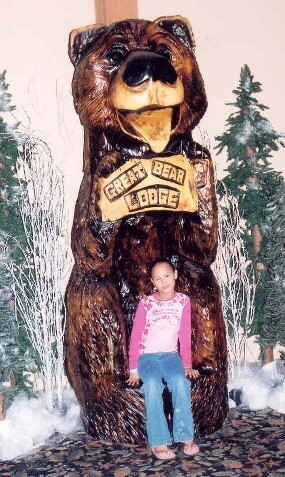 Ketie Beth poses on the lap of a big wooden bear at Great Bear Lodge. 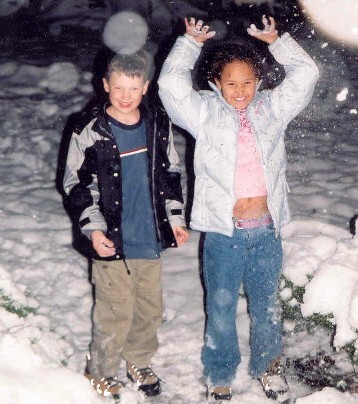 Jeremy and Katie Beth play in the snow in the back yard at Marjean and Tap's house. 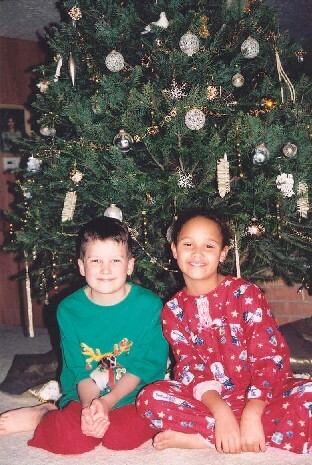 Katie Beth and Jeremy in front of the Christmas tree and Marjean and Tap's house. Marjean, Jeremy, Todd, and Katie Beth sharing the couch together . 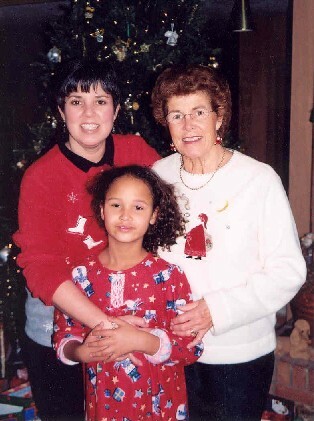 Elizabeth, Katie Beth, and Marjean . 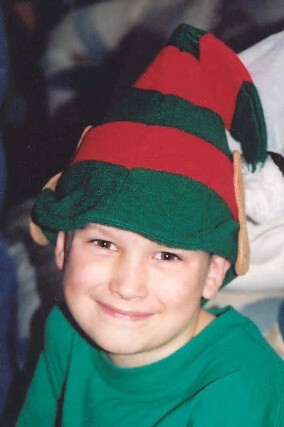 Jeremy wears his new elf cap that he received for Christmas. Tom and Tap at Christmas dinner. 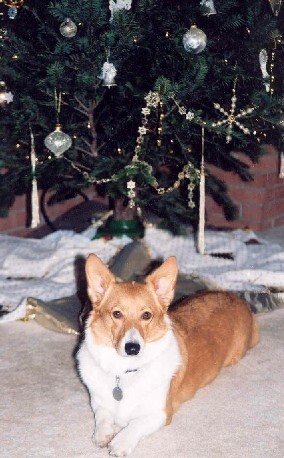 Katie Beth and our Corgi dog Molly on Christmas Day. 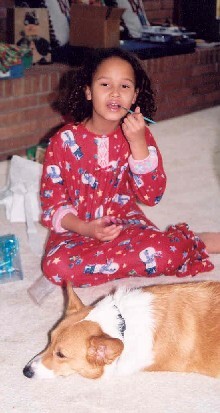 Katie Beth appears to be eating a paint brush, or perhaps she's applying some new lip gloss that she received as a Christmas gift. Tap, Katie Beth, and Jeremy. 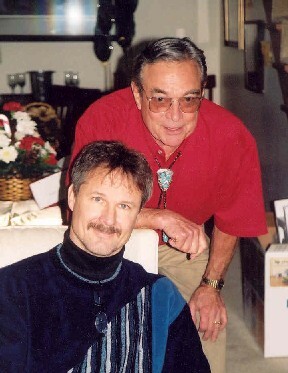 Check out that cool silver and turquiose bolo-tie that Tap is wearing. Molly was a real trooper during the whole vacation. Except for numerous potty breaks, she had to stay in her cage during the entire trip up to Ohio and back to Texas. While in Ohio, Molly had to compete for attention with two other dogs, Shasta and Brigette, who reside with Marjean and Tap year round. 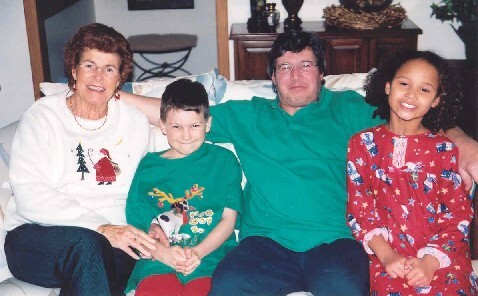 Paula Begeot, and Bill and Judy Matter and their family and our kids. 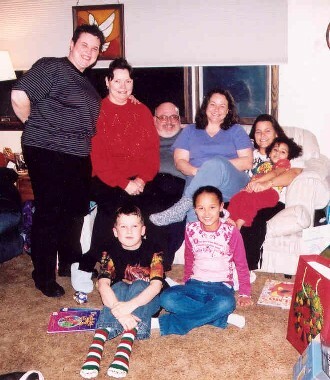 We visited with them in Pennsylvania for dinner one evening and had a post xmas party. 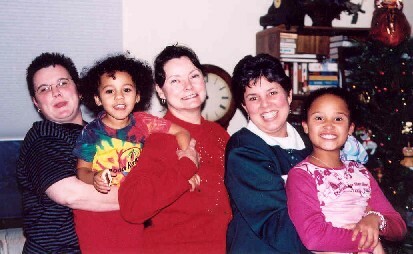 Paula Begeot, Olivia, Judy Matter, Elizabeth, and Katie Beth. 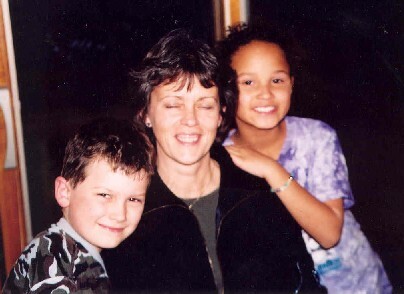 Jeremy and Katie Beth with Gail Schneider. Gail is a long time friend of Elizabeth's. They went to high school together and have stayed in touch for over 30 years. Tom received this really cool book from Marjean for Christmas. It is entitled: "Death in the Grand Canyon". It discusses all the interesting ways that people have died in the canyon. This includes falling over the edge, heat stroke while hiking, airplane crashes over the canyon, drowning in the Colorado River, and other not-so-pleasant ways to die. Tom was riveted to reading it from cover to cover.. 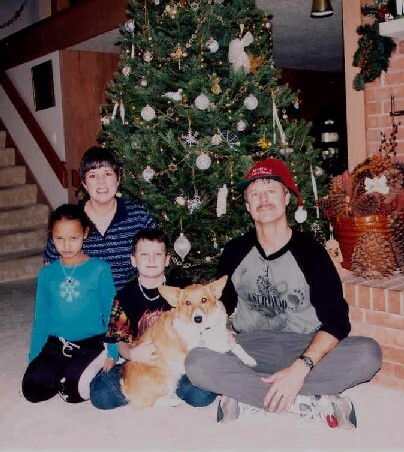 Traditional holiday family photo in front of the tree. Tap and Marjean treated us to lunch at Perkins Restaurant. It was our last stop before hitting the road to drive back to Texas. This photo was taken in front of the restaurant. 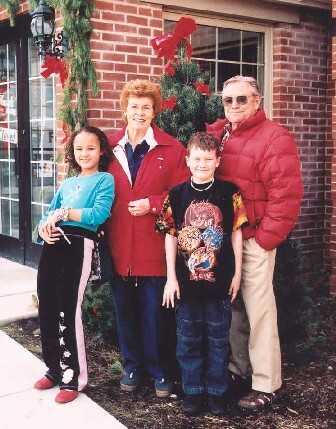 Note how tall our kids are compared to their grandparents. Katie Beth is age 7, and Jeremy is age 8-1/2. 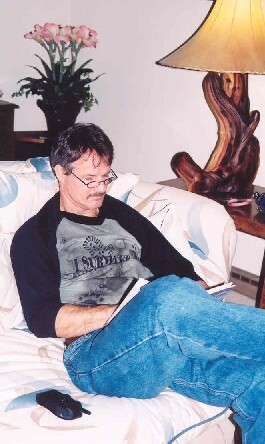 Finally back home in Texas, Tom is reading a holiday newsletter from some friend or relative whose card and letter got put on hold for 10 days, while we were out of town. Tom had to go to the post office to pick up our backlog of mail and then sat down in the kids playroom to read it. 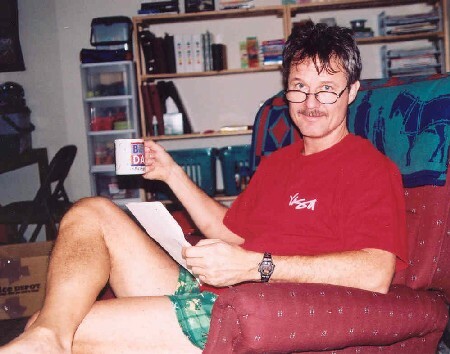 Note that Tom wears boxers at home.